The Juki DX7 is a leading sewing machine that focuses on ease of use, touch option selection and efficiency. Known as one of the top sewing machines on the market, the Juki HZL-DX7 is feature-rich, offering everything expert seamstresses need in a sewing machine. Juki offers an advanced sewing experience that helps make experts better at their craft and pushes novices to sew professionally. Each feature is carefully planned to offer efficiency, speed and quality when sewing. And the features start with an easy threading system, bobbin preparation and winding system. You’ll get up and running faster with the DX7. Like the Juki f600 reviewed earlier, the Juki DX7 is computer controlled, offering an advanced operation with simple use. You’ll start your first project by threading the needle. An automatic threading system puts an end to finger pricks and time wasted trying to feed the thread through the needle’s eye. All you need is one hand to thread your needle. Now, you can move on to the bobbin system. A bobbin winder system is in place with an independent motor. You’ll simply start the winding yourself by winding some thread around the bobbin. Now, pass the thread through the guide. You don’t even need to pull the thread up! A guided system makes preparation a breeze, and when you’re done, there is a cutter right next to the bobbin. The cutter allows you to cut the thread after winding without needing to use a scissor. The Juki HZL-DX7 offers fast straight sewing at speeds of 1,050 stitches per minute. You can sew at rapid speeds, or you can hold the needle button to sew slowly. This is the perfect option when working near stops or starts, where precision sewing is a must. The low-speed inching sewing also makes sewing corners fast and more precise. But all of your sewing starts with one thing: foot controls. The foot controls on the Juki DX7 are a lot different. You’ve never used a sewing machine this complex before. What’s different with this machine compared to most of the others on the market is the foot switch function. What does the foot switch function offer? You’ll be able to work faster and more effectively when your foot controls these vital functions. I found that it does take some time to get used to at first, but it’s worth the extra learning curve. Utilizing the foot controls will become second nature to you given enough time to practice. There are a variety of stitches offered, all controlled through the touchscreen interface. You’ll be able to choose between 287 stitch patterns. There are four available fonts as well as 10 direct stitch patterns. You can use the Juki DX7 for everything from clothing to fabrics. Heavy-duty, the sewing machine is powerful enough to sew through denim and thicker fabric without missing a beat. You want to use a variety of stitches for projects – not just one. But this doesn’t mean you have to change the stitch type. Instead, you’ll need to adjust the width and length. These options can be adjusted using the stitch adjustment dial. And when using a zigzag stitch, you’ll be able to make slight adjustments during the sewing process. Elongation patterns can also be created. It’s an easy way to make adjustments when sewing. Note: Tension settings are done automatically, so you never have to worry about trying to pick the right tension level for your fabric. Presser foot height can still be adjusted in free motion sewing to allow for use with a variety of fabric thicknesses and types. Start and end your sewing with two main stitches: reverse stitch and lock stitch. You can switch to the lock stitch option with the press of a button. If you press the button in the middle of a pattern, the unit will stop after one cycle. Starting and reverse stitch speeds can be adjusted. The float function is enabled by pressing the float button. When you have the float function enabled, you can sew with the presser foot slightly raised. Floating allows you to sew without pushing the different layers or creating uneven seams when sewing. There’s even 0.1mm increment adjustments to lift the presser foot to your exact preference. A knee-lifting lever is included with the Juki DX7, which allows you to lift the presser foot up to 0.5″. The lever also allows you to switch back to the automatic function for ease of use. The presser-foot pivot function allows you to sew corners or make pivots with ease. You can resume your sewing at any time, and the foot will lower automatically to allow for smooth sewing. You can choose to switch off the automatic pivot function if you wish. After thread trimming, the presser foot is lifted. The automatic lifting function allows you to rapidly remove fabrics. If you don’t like this function, there is also an option to automatically switch off the automatic presser foot lift. Juki allows for most automatic features to be turned off to better accommodate your needs. Touchscreen offers an intuitive way to adjust your sewing machine’s settings. Boost the swing speed up to 1,050 stitches per minute, or slow down the stitches for greater control. Automatic bobbin winding stops when 2/3 full. The only small complaint with the Juki HZL-DX7 is that the automatic bobbin winding system will stop winding when the bobbin is 2/3 full. What does this mean? It means that you’ll need to refill the bobbin system more often. When sewing larger projects, this will take up additional time. While not a big deal, it’s something that is worth mentioning. Besides this small “complaint,” the Juki DX7 is one of the better sewing machines on the market. You’ll set up your project faster, be able to choose among hundreds of stitches and enjoy automatic features that make sewing more intuitive. Juki has thought of everything with the DX7. 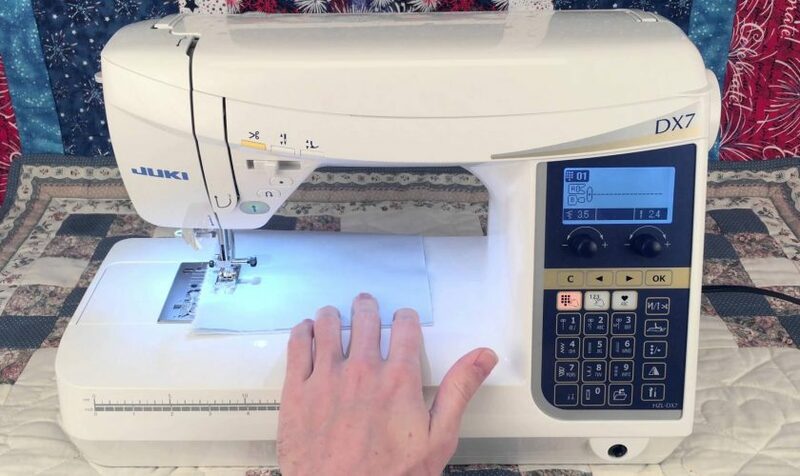 It’s the sewing machine that makes expert seamstresses better at their craft and it’s a sewing machine that’s easy enough for beginning users to pick up and start using. On my Juki Exceed, the “bobbin winding regulator” is the thing that you push to start winding the bobbin. It has a small screw at the top. By turning this you can adjust how full the bobbin should be when it stops winding. I think most sewing machines have this adjustment option, but few instruction manuals ever mention it. Anyway, hopefully this information will allow you to get full bobbins. Totally agree with adjusting the sto on the bobbin winder. Learned that trick from the repairman years ago. I am having a hard time deciding between the Juki f600 or the DX7. Which would you recommend? Definately the DX7. It has extra lighting…so much that you could sew in an otherwise dark room. Also, theres a lot of throat room with the DX7 to make free motion quilting easier. The float function is invaluable to me and has saved me much frustration. Also time saving are the pivot function and the heel function on the pedal which you can set to sew in reverse, cut threads and raise presser foot, just raise presser foot or sew in place to tie off your stitching. It’s super easy to set any of the features and functions of this machine suit your own personal preferences and needs. The only complaint I have is there aren’t enough heirloom stitching options. Love it otherwise., and I sew almost every day for many hours each week. I’ve had my DX7 for 2 1/2 years and she’s still going strong.